Hamby Home(in)stead ...: Egg-citing Stuff! Who would have thought four chooks could bring such joy?! I went into Vaughan's room very early this morning, to tuck his covers around him. We had a bit of a snuggle and he gave me a sleepy kiss, then muttered "we have chooks!" before dozing off again. When he did get up much later, his first mission was to let the girls out and then he managed a few minutes of cricket-collecting before heading off to school. Although Vaughan checked for eggs before leaving, there was no action at that stage. By 10:30am though our girls had laid three eggs - and there was much excited cackling (from us, not them)! I'm not sure which chook was having an RDO but really today's offerings were a bonus because I wasn't expecting any eggs from our chookies so soon after their arrival. We left the eggs for Vaughan to collect when he came home from school. He was so very chuffed to see them! 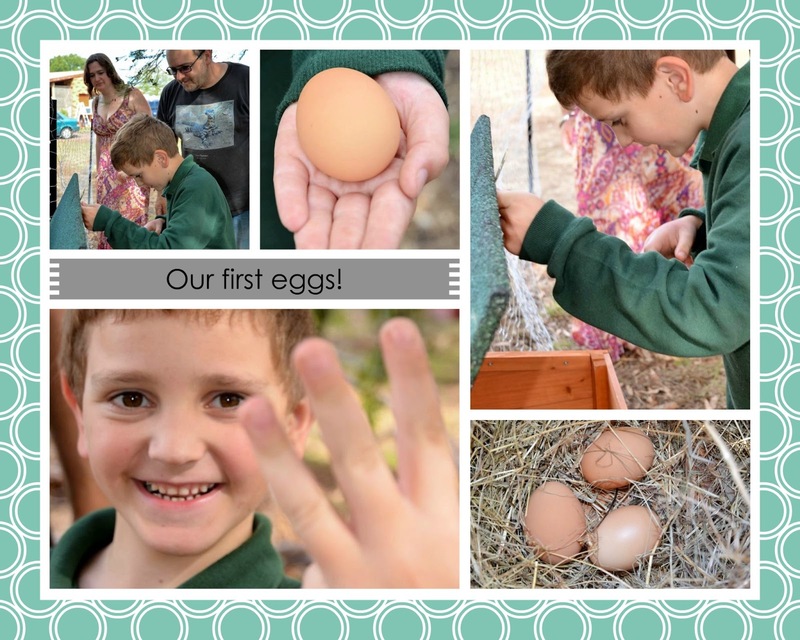 Given school holidays will soon be upon us, it won't be long before he has the extra excitement of collecting eggs that are newly-laid and still warm. Nick and I worked in the garden for some of the day. At one point we wandered down to the mailbox. We collected two crickets and some slaters on the way back . Nick seemed to think that if we offered four crickets, they would be shared equally among the girls due to some sort of chook democracy! Er, no. It was definitely every chook for herself, though a pecking order is becoming evident.